Part of my job involves telephone communications with our remote IT department. I speak Texan, they speak Yankee. Don’t even think the two are remotely similar. I may as well say I speak Pongo-Pongo and they speak Thai. Case in point – I placed a request for an employee to have access to a shared resource on the network. The folder they needed to access was called “Texas”. A simple enough request, and yet days went by and it still hadn’t been completed. It’s Dallas, (not), and Texans, (not) on a New Reality (not) Series! The not-Dallas, not-even-Texan – filled “reality” series, “Big Rich Texas” which I was blissfully ignorant of until this morning, has now raised the ire of this Texan. I am not “big, rich Texas”, but then again neither are the stars of this pseudo-docu-crapola-drama. Of course, the bios on these babes read like they are Texans but according to Oh So Cynthia they are mostly Californians. Them’s fightin’ words ’round these parts. And, to add insult to injury, the “Dallas” country club they all infest belong to? It’s in Ft. Worth….further fueling a crosstown rivalry at least as old as the Alamo. You want Dallas reality? Come visit. 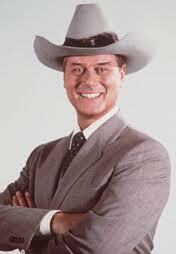 You want “Dallas” reality? Watch the classic 80’s drama with JR and the rest of the Ewings. Hi! I may not be a Texan, but I look cool in this hat, don't I? Posted in Random Crap, What the flippity-flop?